Chicken is a staple in our house, which I cook two or three times a week. My boys are picky about the type of beef that they will eat, but if a meal involves chicken, they will lick their plates clean. Roasted chicken is an especially easy and well received recipe in my house, so I am always on the lookout for a new option. 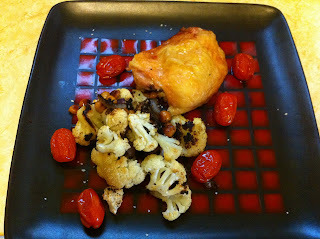 A recent issue of Everyday Food had a recipe for Roasted Chicken with Cauliflower and Chickpeas that I tried. This recipe is simple, with only 7 ingredients (two of which are salt and pepper) and easy to put together. The roasted vegetables turned out great, with the chickpeas adding a nutty flavor. My one complaint is with the roasted chicken, it lacks flavor. My husband's solution was to dip his serving in barbeque sauce, while my children ate it without noticing the blandness. If I was to use this recipe again, I would add flavor to the chicken after transferring it to another pan, it needs something to enhance the flavor of the roasted chicken. As the recipe stands, the vegetables are great, the chicken just basic. For the recipe look in the April issue of Everyday Food. Note: Recipe not currently available on the official Martha Stewart website, will post when available.